Accurate data collection, done consistently and over a long period of time is an essential ingredient in quality stud management. 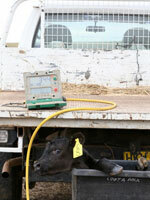 At Coota Park we take great pride in keeping quality, comprehensive and detailed data on all our stock. Without this integral data collection it is impossible to make good genetic progress in the areas that really matter. No other cattle stud in Australia records this much data! Coota Park has implemented a grazing strategy to enable us to maximize rest for our grazing pastures. Increasing mob size and planning stock movements has enabled us to better utilize the feed we have as well as create more. For the second consecutive year we used James Sutton from Sutton Breeding Services to ultrasound pregnancy-test our cows. His accuracy is fantastic. This lets us know accurately within a ten day range the date of calving thus making management and culling very easy. This is an excellent tool which helps improve selection for fertility by removing late-in-calf cows as value-added products and shortening up your calving. Coota Park Blue-E hopes to develop a program where other producers purchase Blue-E cows from Coota Park – then Coota Park will purchase back the progeny. This is to be a mutually-beneficial arrangement that will enable Coota Park to expand its breeding program. Full details will be finalised in the near future.